Vienna, Austria, is divided into 23 districts. Districts 1 through 9 make up the center of the city. Most of these central districts are densely populated, and each contain unique cultural sites or institutions. The 1st District, called Innere Stadt, is the center of the city, with the rest of the districts built around it. The 1st District has the famous Ringstrasse, which is a an avenue that goes around the old city part; it was created in the late 19th century to replace the old medieval city walls. Innere Stadt is a beautiful, expensive area full of famous Viennese sites, like the State Opera, the house of the president and many other historical monuments. It is an old, romantic district full of cobblestone streets, shopping and cafes. 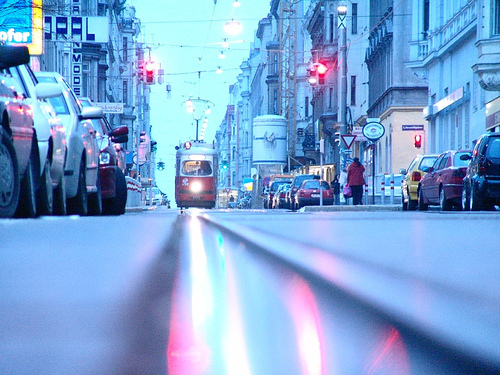 It is the least populated district in Vienna, and is more tourist-oriented. It also is home to many political buildings, such as the houses of parliament, the city hall of Vienna and other assorted administrative centers. The 2nd district is Leopoldstadt, which is an island across the Danube Canal from the 1st district. It is mostly a residential suburb today, but it is the historic home to Vienna’s Jewish community, where Sigmund Freud and Theodore Herzl had once resided. 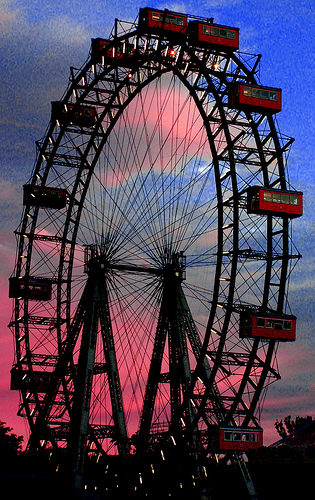 Leopoldstadt is home to the Prater, which is an amusement park with a famous ferris wheel. Many immigrants and students reside in Leopoldstadt, because it has cheaper rent than much of the city and it is still very central. It is a relatively big district where almost 100,000 people live. Apart from Prater, not many tourists go around Leopoldstadt, because there are fewer attractions here than in other areas of the city. The 3rd district of Vienna, also known as Landstrasse, is a more working-class residential area with some less attractive housing. However, the famous rococo Belvedere Palace and its indoor art museum contrast the overall vibe of this neighborhood. Landstrasse is also home to the St Marx cemetery, which has the corpse of Mozart, who was buried there in 1791. 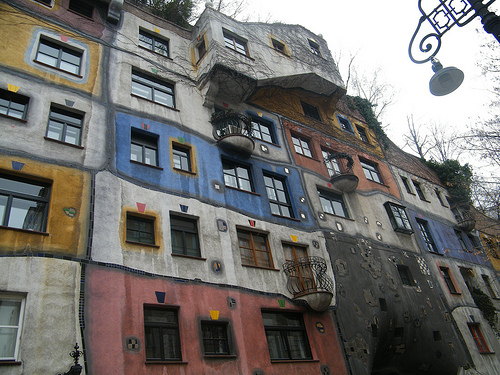 Another interesting site in Landstrasse is the Hundertwasserhaus (above), which is a very colorful, surrealist looking building that has grass growing on the roof. The 3rd district does not feel very central when you are in it, but is well connected to the rest of the city through public transport. The 4th district is called Wieden, and it is a young neighborhood full of students and artists. 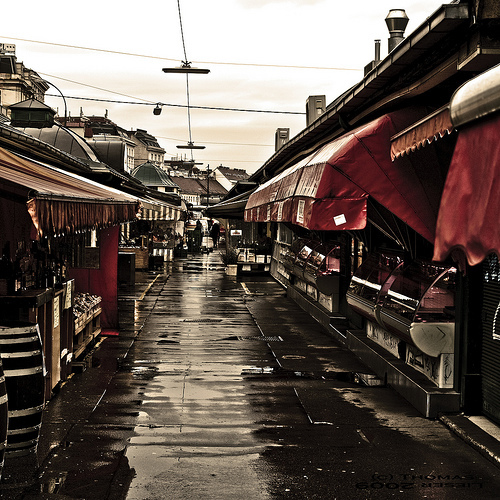 There are many historic buildings, as well as the Naschmarkt, which is the biggest fresh food market in Vienna that has very cheap produce. The 5th district, Margareten, is relatively small and is largely inhabited by Turkish and Balkan residents, though some students live there. Many of the buildings come from the socialist era after WWI, and there are large apartment blocks that were intended for low-income living. 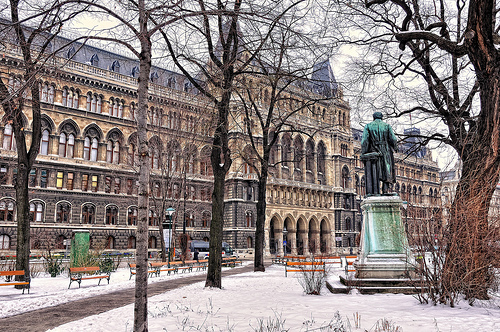 The 6th district of Vienna, known as Mariahilf, has much action going on, and is a popular shopping district for products like clothes, designer furniture, cell phones and other electronics. It is a heavily populated urban area full of young adults, and also has a sophisticated theater and art gallery scene. There are also some technology and vocational schools located in the 6th district. The 7th district, Neubau, is most famous for the MuseumsQuartier, which is full of many classy museums, shops and cafes. Beyond the museums, it is an expensive, liberal, very urban part of the city, populated by intellectuals and young professionals. The streets are full of trendy but upscale cafes, restaurants and boutiques. Other important sites in Neubau are the Volkstheater Wien, a mainstream theater, and the Austrian Ministry of Justice. The 8th Viennese district is Josefstadt, which is the smallest district, but is nevertheless heavily populated. It is considered a middle-class neighborhood, and is a quiet residential area that is situated behind the city hall, near some famous museums. It is full of little parks and pleasant cafes. 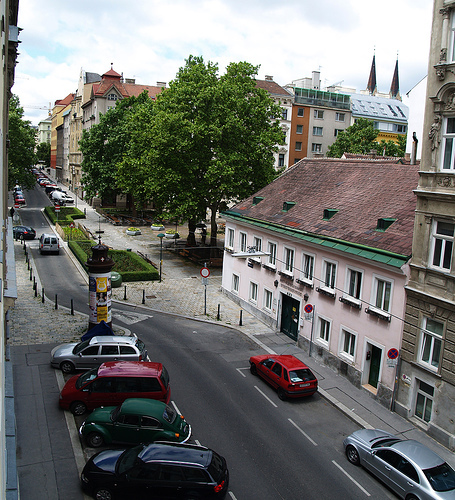 The eastern part of Josefstadt is populated by student dormitories from the University of Vienna. The eastern part of the district has a large foreign population. Many workers live throughout its premises, though many mayors of this city have lived in Josefstadt. The 9th district is known as Alsergrund, and it is covered in fancy historic architecture as well as government-built housing. It is very centrally located, just north of the 1st district. It is often called the Academic Quarter, because the University of Vienna and University of Economics and Business Administration are located in its boundaries. This district also houses many large hospitals. Because of such institutions, the area is full of students and medics. Apart from this, there is also the Palais Liechtenstein, which has two main buildings and a park in between them that is open to the public. 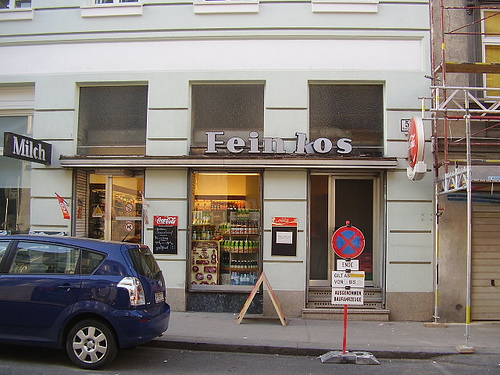 Freud used to have an office in this district, which is now the site of the Vienna Sigmund Freud Museum. CONS: high costs, the 50m2 penthouse loft I was lucky enough to share cost around €2,000 and that was 15 years ago! Not much green space. The parks are quite small and you are not supposed to use the lawn.